Jenny McKerr has spent most of her working life in the beef industry. It's a passion that led to her taking over a small livestock farm at Climpy in South Lanarkshire a couple of years ago. So when she decided to start up the only distillery currently operating in the county, The Wee Farm, she was clear what sort of gin she wanted to make. 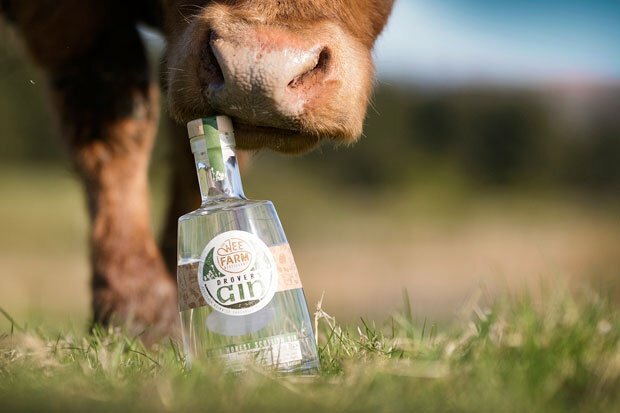 'I've got a real passion for farming and beef,' explains McKerr, 'so our starting point was that the gin should go well with a good steak. It's always red wine with a steak, which can dehydrate you – we wanted a drink that would be more refreshing, while still complementing the beef.' The resulting Drover's Gin has 13 botanicals including citrus, thistle and heather. More unusually it also includes pink peppercorns and allspice, which McKerr credits most for the successful marriage with prime Scottish beef. The most important member of the operation is Morag, the mini still installed at the farm. 'She's only small at 30 litres but she's really good,' says McKerr. 'Her size means we can experiment a bit more, try out new botanicals and work on our future products.' Those products also include the Wagyu Shorthorn cross cattle that are expected to be treading McKerr's fields soon. Micro-distillery run by Jenny McKerr on her small livestock farm, with bottles of their Drover's Gin available to order for delivery or pick up from the farm.